View these FREE 30-minute sessions. Hear from authors, illustrators, and literary leaders on best practices, tips and tricks to running a vibrant library. And take a listen as our editorial team chats about popular and upcoming books. Get insights from experts and all the latest about the titles your readers will love! With a powerful blend of illustrations and captions, Graphic Novels teach students crucial skills in visual literacy and reader empathy in ways that prose alone cannot. 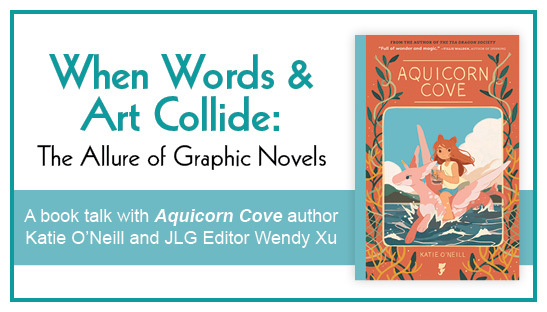 Join Aquicorn Cove author Katie O'Neill & JLG Graphic Novel category editor Wendy Xu for a free webcast on the allure of this creative and popular genre. Learn how to use social media to attract students and promote your library! Melissa Stewart and our own Kayleigh Hanlin for a look at fact-filled stories for that are sure to pique everyone’s interest. Popular and emotionally powerful titles that dig deep into love, loss, and the impact they have on our lives. Listen in as Kayleigh Hanlin and Mahnaz Dar discuss K–12 books receiving rave reviews. A quick look at online resources, programming ideas, and marketing tips for every librarian who loves great books. A new year brings a fresh look at books for your young readers. A review of some of the most popular elementary titles to add to your collection. Join Deborah B. Ford and Kayleigh Hanlin during this speedy introduction to popular must-have titles for your collection. What makes comics and graphic novels so powerful? Beanstack's Felix Brandon Lloyd on the power of reading contests and tips for success. Important insights from industry professionals about successful reading challenges. Discussion of JLG's Hi-Lo titles and what makes for a compelling book for developing readers. Listen in as the leaders of the JLG editorial team discuss elementary must-read selections. The JLG editorial team takes a deep dive into popular middle school selections covering a range of subjects. JLG's Susan Marston and former Scholastic exec discuss our 2019 ALA Youth Media Award winners. Join JLG’s Lucas Klauss and former Scholastic exec Elissa Tomasetti for a deep dive into the hottest titles in YA. The Horn Book's Roger Sutton interviews author Ilene Cooper about her book Eleanor Roosevelt: Fighter for Justice. Learn about how digital tools can advance the love & skill of reading in the gadget generation. Find out how creative new Nonfiction titles are making the genre more accessible than ever.